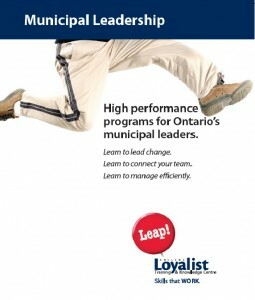 High-performance programs for Ontario’s municipal leaders. Click Here for our Municipal Leadership Brochure! With these concerns foremost, we have developed a four level Ontario Municipal Leadership Program to provide the most practical, proven tools to achieve these goals. Amalgamations, provincial downloading, partnerships, and increasing costs—they add up to an extremely demanding workplace for municipal leaders. Survival and growth in today’s municipal climate mean meeting the constant challenges presented by fiscal responsibility, increased accountability, demands, and pressures from member/partner municipalities and the general public. We ask a lot from participants in these programs. In return, we guarantee a learning experience that is second to none with lots of action learning activities geared to highly-motivated adult learners. Our unique “Partner from the Start” program ensures flexible scheduling in cohorts so you can choose learning themes and dates that fit your needs. Yesterday’s solutions are not enough. We need new Skills that Work to deliver a leap in productivity. Each of the four levels of our Municipal Leadership Program challenges participants to go farther and higher than they may have ever believed possible. High-potential workers learn the skills they need to move into the management leagues. Non-unionized managers with direct reports and at least two years in their current role learn how to vault from mere competence to excellence. Graduates from the High-Performing Manager program implement change in real time with the support of their peers and expert coaching. The elite training and coaching program for department heads and business unit leaders. A challenging curriculum with far-reaching implications for change and renewal. A review of municipal leadership training from Northumberland County’s Forest Manager Ben Walters.